This is a British Churchill tank track link which is complete and has 2 pins still in place the link is rusty but very solid and very heavy does have some maker markings clear to see .The track link was recovered from the area around Caen ware Operation Epsom in June 1944 took place during the battle to capture Caen in Normandy.This is a rare find from the battlefield as British tanks are not so numerous on the Normandy battlefield as German and US tanks a very nice relic from the famous battle in the summer of 1944 in Normandy.This item comes with a laminated 5x7 information sheet with information and photos. Operation Epsom, also known as the First Battle of the Odon, was a British offensive that took place between 26 and 30 June 1944, during the Battle of Normandy. The offensive was intended to outflank and seize the German-occupied city of Caen, an important Allied objective, in the early stages of the Allied invasion of north-west Europe. Preceded by Operation Martlet to secure the right flank of the advance, Operation Epsom began early on 26 June, with units of the 15th (Scottish) Infantry Division advancing behind a rolling artillery barrage. Air cover was sporadic for much of the operation, because poor weather in England forced the last-minute cancellation of bomber support. Accompanied by the tanks of the 31st Tank Brigade, the 15th (Scottish) Division made steady progress and by the end of the first day had overrun much of the German outpost line, although some difficulties remained in securing the flanks. In mutually costly fighting over the following two days, a foothold was secured across the River Odon and efforts were made to expand this, by capturing strategic points around the salient and moving up the 43rd (Wessex) Infantry Division. In response to powerful German counter-attacks, by 30 June some of the British forces across the river were withdrawn, bringing the operation to a close. 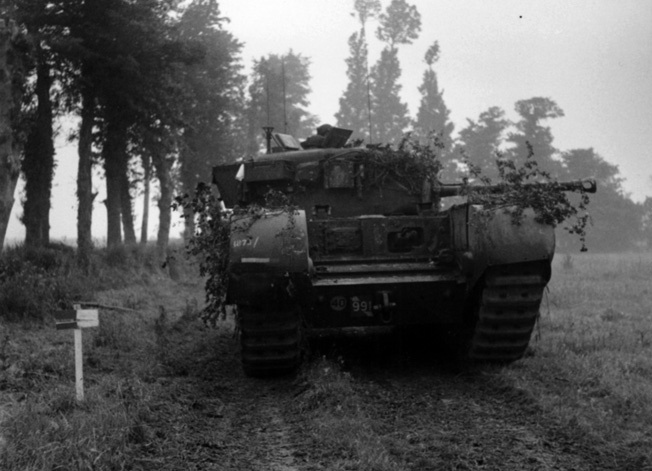 During Operation Epsom near the French town of Caen,a Churchill tank of the 7th Royal Tank Regiment, 31st Tank Brigade moves along a dirt road. Branches have been placed about the hull as makeshift camouflage.